So far in this series I've looked at how changes in music formats have affected the way that I consumed music and made 'playlists'. The progress has pretty much followed the same pattern as the overall progress of music formats - up until the introduction of the Compact Disc. Having successfully induced a large proportion of the record-buying public to migrate from analogue vinyl to digital Compact Disc, the music industry next attempted to migrate consumers from analogue cassette to a new digital alternative. I didn't try out every new format that the industry developed, and never succumbed to the marketing hype around the new digital cassette formats. The mistakes made have been well documented, but essentially, the new formats did not offer a significant increase in either quality or convenience to be worth upgrading for. For example, the move from vinyl to CD offered a significant advantage in the amount of storage space required. Instead of having rows of 12" by 12" packaging, you had much smaller packaging, which was great for both consumer and retailer. Well, except, oddly, in the USA, where for a long time CDs were sold with a completely superfluous extra cardboard 'long box' bringing the total package size up to closer to 12" tall. 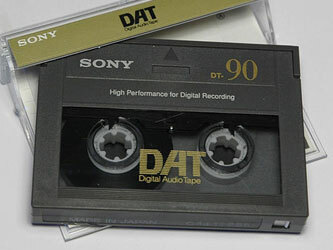 Nobody had learned from the VHS/Betamax saga, and there were two competing incompatible formats - DAT (Digital Audio Tape) and DCC (Digital Compact Cassette). This was an even more drastic situation than the recent Blu-Ray/HD-DVD situation. At least both DVD formats were based around a 5" disc, and you could envisage that eventually at some point there might be players that incorporated the technology to play back both types of discs. 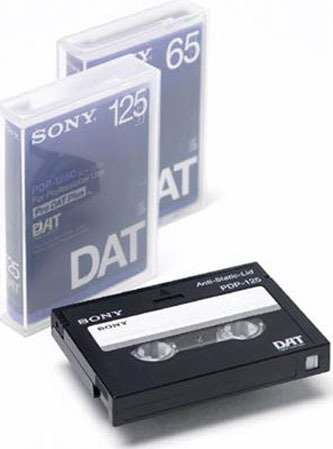 The DAT and DCC tapes were completely different sizes, with different transport mechanisms, so there was no prospect of there ever being a hybrid deck. 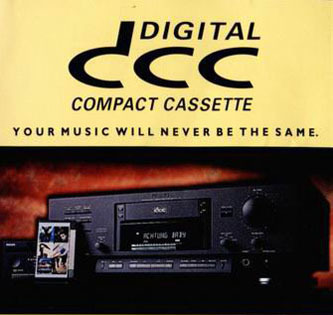 Plus, unlike the new generation of DVD players, neither DAT nor DCC were the same size or shape as the Compact Cassette, so there was no equipment that was backwards compatible with a popular format which had been around since the mid-60s. And there was a bigger problem, namely that the standard Compact Cassette was pretty much good enough for slinging into the car or carrying around in a Walkman. Sure, sometimes they got chewed up by an over-enthusiastic tape machine, or unspooled themselves if they were thrown around too much, but essentially, as the cheapest and most disposable music format they did the trick. Neither DAT nor DCC could claim to be immune from the same flaws that using any type of physical magnetic tape entailed. The tape might snap or unspool, and inevitably the encoded magnetic signal would deteriorate over time. 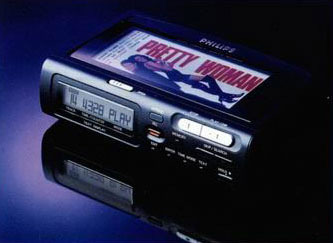 In fact, this was worse than the Compact Cassette. An old analogue tape sounds muddy, faded, and might have an inconsistent wobbly stereo. A stretched and worn analogue tape sounds warbly. By contrast, a stretched and faded digital signal simply becomes unreadable. It isn't just a case of listening to music that doesn't sound as good a quality as when it was first recorded, it was a case of tape being unusable. Despite the best attempts of the music industry to get me to buy DAT or DCC, the next major change in my music listening habits was prompted by the arrival of Sony's MiniDiscs. Although it was never a mainstream success, it was one of those formats much loved by the people who did use it. By Martin Belam on 24 July 2008.